Airbnb's Healthy Travel and Healthy Destinations report shows that its platform and community model helps fight mass tourism, promotes sustainable travel and is changing the economics of travel and tourism to the benefit of local families and communities. Across the eight global tourist destinations studied, at least two-thirds of all guest arrivals on Airbnb take place outside of traditional tourist areas, and 72 to 93% of Airbnb listings are located outside of areas that are at risk for overtourism, as a result of homes being less concentrated than hotels. This encourages geographic diversity and distribution of guest arrivals. The analysis also shows that 61% of all Airbnb host guidebook recommendations offered around the world are only recommended by one host, meaning only the guests of that particular host are being directed to that location or activity through Airbnb. Globally, this implies that today, one can find over one million individual-host guidebook recommendations that no other host recommends – a welcome antidote to standardised tourist maps that spawn what Tourtellot describes as “generic businesses”. “These generic businesses force out distinctive local shops, eateries and crafts,” he says. The vast majority of each dollar spent on Airbnb flows directly to hosts, who keep up to 97% of every dollar, euro or pound they charge to rent their space. Hosts then spend and reinvest their earnings in a number of ways including household expenses, rent or mortgage payments, cleaners, home improvement, healthcare and education. Relative to chain hotels, a much smaller percentage of home sharing spending is paid in fees. This stands in stark contrast to tourism spend with hotels, where anywhere between 14 to 36 cents of each chain-hotel dollar may never reach the actual destination community. On cruise ships, data shows the only potential benefits for local communities from cruise ship accommodation spending are fuel costs and local transportation costs of shuttling day-trippers from a port to a limited number of sites. In a study of eight of the world’s most popular travel destinations at risk of overtourism, including Barcelona, Venice, Amsterdam and Japan, data shows that Airbnb accounts for just 7% of all guest arrivals, including hotel and cruise ship guests. This equates to 0.37 guests per local resident on Airbnb, compared to 5.1 tourists for every local resident – or almost 14 times more non-Airbnb than Airbnb guests. 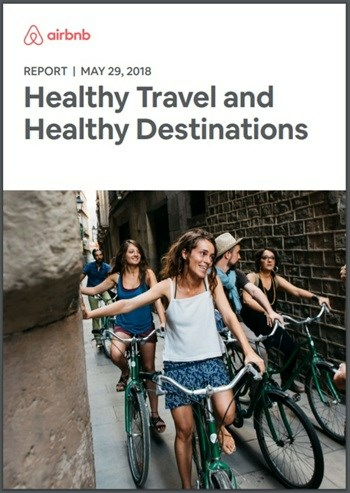 The report follows the launch of Airbnb’s Office of Healthy Tourism, which aims to promote the development of healthy tourism across the world, and the launch of global data on the positive impacts of home sharing in more than 300 top cities and 80 countries across the world.